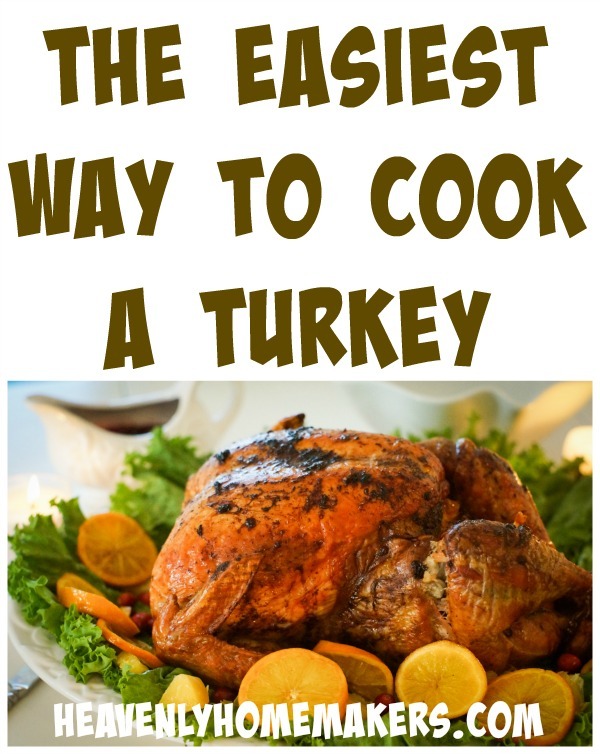 Ready to learn the easiest way to cook a turkey? Lean in. This is so helpful! Clearly the easiest way to cook a turkey is to let someone else cook the turkey. 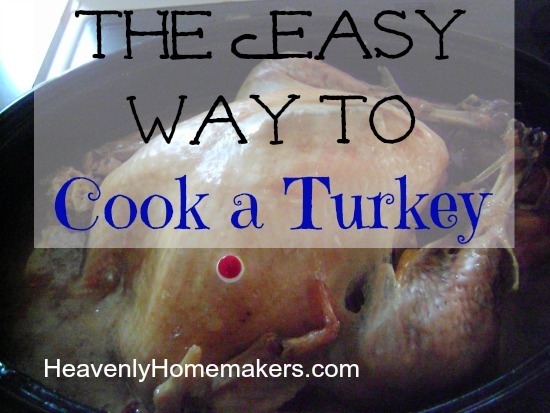 ;) But, if you’re the one in charge of preparing the meal this year…let me share the easiest way I’ve found to cook a turkey. I remember being so intimidated to cook a turkey the first time I hosted a Thanksgiving dinner. I called my mom a million times to ask questions. Could it really be that cooking a turkey is as simple as taking out the innards, putting it in a pan, covering it, and baking it? Yes, it is that easy. My holiday turkeys are not fancy. I don’t stuff them. I don’t slather them with anything. I just put them into the oven and cook them. They create their own broth…smart little birds that they are. 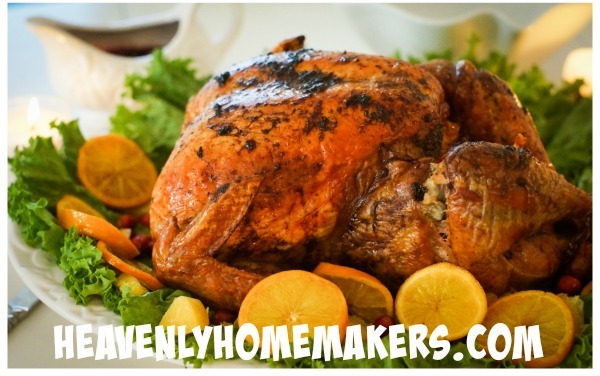 Thaw your turkey: Place the turkey in the refrigerator for 3-4 days until thawed. Prepare your turkey: Once the turkey is thawed, reach in and grab out the bag of giblets. (This is by far every one’s favorite step, right?!) Empty the giblets into your roasting pan as they help make a good, rich broth. Place the turkey, breast side up, into a large baking pan or roaster. These are my favorite kinds of turkey roasters. I picked mine up at a garage sale one year for 50 cents! Cook your turkey: Season your turkey any way you like. I find a turkey to be so flavorful as-is, I rarely do much with seasonings. Though salt, pepper, garlic, and onion make the turkey a step above! You can cook your Thanksgiving turkey as many days ahead of time as you want. I know most of you like turkey fresh out of the oven on Thanksgiving Day. But, here’s what I learned from my mom, and it really saves a lot of trouble on the big day when I’d really enjoy visiting instead of messing with a big bird. Cook and cool your turkey any day before Thursday. De-bone and put meat in baggies. Pour broth into jars (3/4 full). Freeze or refrigerate, depending on how far in advance you cooked the turkey. If frozen, thaw in refrigerator the day before serving. To reheat turkey, put as much light and dark meat as you think you will need for the Thanksgiving meal in a 9×13 pan. Drizzle a liberal amount of broth over turkey, cover and warm in 300° oven for 30-45 minutes or until meat is hot and steamy. No one will ever know that you prepared your turkey ahead of time (except for the fact that you won’t be carving the turkey in front of them). It is always juicy and moist. I do it this way every year, and I’m always so thankful that the messy part is over before Thanksgiving day! Are you in charge of cooking a turkey this year?! Do you stuff your turkey? Have any more helpful turkey cooking tips to share? You might also want to know: How to Make Turkey Gravy. In addition to our turkey I will be cooking almost 200 lbs for our church dinner. I baste mine in a mix of butter/soy sauce and liquid smoke, the liquid smoke makes it smell WONDERFUL, the soy sauce give it a rich, brown color and the butter makes the skin crispy, I cook it uncovered and empty then put a foil “tent” oven it if it looks too brown before it’s done. I am going to cook one this year (actually several sale birds, to be cooked throughout the year). :) How hard can it be–just like roasting a chicken, only a little bigger, right?! I found a recipe for a roasted dry-rub (paprika, brown sugar, etc.) in the Nov. issue of Southern Living that I think I might try. I’ll let you know how it turns out! Thanks for the turkey roasting tips. I am on the lookout for a good roasting pan myself, so the picture and recommendation was helpful. Maybe I can find one at the thrift store someday. I cook mine almost just like this–except I cook it breast down, which makes for a juicer turkey. Also, when I freeze the meat (I buy 7 turkeys every year in November, cooking and freezing four of them before Thanksgiving), I dip the pieces in the broth from the pan before freezing. This ensures juicy leftovers that I can throw in any recipe (say, chicken cacitore with turkey instead of chicken, etc). I am not usually in charge of cooking the turkey for Thanksgiving, but we are getting together with my side of the family this year, and I am making the turkey and most of the meal. I am cooking the turkey ahead of time. I like your plan for reheating it for Thanksgiving Day. I will use that! What a smart idea. I’m going to share it with my sister (who is doing the turkey cooking this year)! Definitely do NOT stuff the turkey, yuck! The thought of RAW juices, including blood seeping into stuffing (or dressing depending on where you are) just grosses me out. I cook mine overnight, and wake to the smell of turkey! I ALWAYS use a meat thermometer, I never rely on those red buttons. i could never cook the turkey ahead of time, I can taste the difference. And the turkey HAS to be fresh, not frozen. A few years back we fried a turkey… that was yummy! For some reason I can’t reply to the ways to use turkey leftover thread. I make shepherd’s pie w/the turkey! I’ve been stuffing our turkey for 25 years. The stuffing seems to taste so much better when it is stuffed in the turkey. Turkeys are cooked for hours so any rawness of course is cooked out. Thanksgiving isn’t the same without stuffed turkey. I don’t like stuffing baked separately. But everyone can cook it to their liking. To each his own. I’m with Marcelle on this one. I’ve been stuffing our turkey for over 30 years. I also cook some separate so as to have an ample supply. That from inside the bird is sooooo much more tasty. As for cooking ahead, I’m going to do it this year. As one gets older they realize that the importance of the holiday is time spent with people. My mom is now passed and my memory is that she spent all of her time in the kitchen and rarely with her guests. If we wanted to talk with her it was always to her back because she was either washing dishes or preparing something. In my later 50’s now I want to cherish the positive memories and learn from the mistakes. After all, the day is about giving thanks and what better way to do that than cherish your loved ones by spending time with them. Sadly, some lessons take much of a lifetime to learn. Thanks for the awesome make ahead tip Laura! I put my stuffing in the turkey also. I tried it one year w/o and did not like it. It was too dry. I also cook my turkey ahead of time. This year I cooked the butternut squash and banana bread ahead of time too. Lets you visit and enjoy the family more. Thanks for sharing this Laura. While some of us may be seasoned turkey chefs, there are still ladies out there that have yet to cook a turkey. It’s not hard, but it can be intimidating, especially if you are cooking for others. If you have time and can afford to purchase an extra turkey – especially when they are 40 cents a pound – practice! Freeze the practice turkey to use in other meals over the next few months! Ladies – don’t forget to make some healthy bone broth from your turkey carcasses!!!!!!!!!!!!! AND, if you’re having mashed potatoes, save the water from boiling the potatoes – it makes a great broth/starter for soups, especially potato and vegetable soup! LOL (we feel identical about stuffing the turkey!)…. I make stock from the bones, adding leftover veggies etc. Also, I slather olive oil on the turkey before putting it in the over. I just stuff it w/lemons, orgnages, and fresh herbs. We get our turkey free after spending 400 dollars at the grocery store over a course of a month. So we don’t spend a dime. We can get up to a 20 lb turkey! I cooked my first turkey last year. It was easy and tasted great! I was nervous about cooking it, so my husband cooked one too (just in case + we have a large family). I don’t have to cook one this year, but I look forward to cooking one again in the future! This is so simple! Thanks for sharing. I too think the turkey should be prepared ahead of time. There are so many different side dishes to make and the house to clean. Laura, you’re a lifesaver!!! I’m in charge of “catering” my husband’s company Christmas party and I’ve been dreading the bird. I’ve never done it before. I think I’ll be doing the cook-ahead method. Actually we have cooked turkeys in a pit before wrapped in foil. That’s a totally different story. Thanks again for the vote of confidence! If you wait till the red thingy poips up on your turkey you will have a dry bird. Go to food network and watch the turkey videos from Alton brown. He taught me the best way to cook a turkey (yes it has a few more steps like brining and aromatics but it’s a juicy turkey that will never fail. I cannot wait to do this at Christmas! My mom will be here at Thanksgiving to help me make it that day, but on Christmas I’m on my own. What an amazing tip and I love that it’s always moist with the gravy warming idea. Thank you for sharing this! THANK YOU! You made this my best Thanksgiving ever, because I got to enjoy it with my family instead of dashing around madly finishing up the potatoes and gravy while carving the turkey while everyone else sat there waiting on me! My day was much more relaxed because all I had to do was mash the potatoes and reheat the gravy :) AND there was room in the oven for everyone’s dishes that needed “just a few more minutes”. thanks for posting this laura! im still enjoying the availabliity of it on your site almost a year later! its time for casseroles again and i thought a turkey would be a great way to go. not to mention i bought an extra one at Easter this year and am finally gettting it out of the deep freeze. thanks again! Always cook your turkey to at least 170 degrees. Checked in the meatyest part of the turkey. Never leave turkey out of oven or refridgerator for more than 4 hours as bacteria will start to grow in your turkey. If turkey cools to fast put back in oven to reheat to 170 degrees. This is for your safety and your guests safety. Have a Great Thanksgiving! I’m not too worried about stuffing my turkey being contaminated by blook. The blood is in the meat as well. So it should all be thoroughly cooked by the time my turkey is done. It should be as “sanitary” as the cooked turkey. Yes, this will be fine. Once it has been fully cooked, you can eat it cold if you want to. We are having 20 adults for Thanksgiving. We have 1 oven. How big a turkey? What about cooking a turkey on Thanksgiving Day and a turkey breast the day before? How would I store and reheat the breast? I suggest 1 1/2 pounds of turkey per person. So, for 20 people, I’d get about a 30 pound bird. I’d cook and reheat the breast the same as suggested in the post with a regular turkey – pour broth over the turkey breast and reheat in the oven. No, there’s plenty of drippings to use both for making gravy and reheating the meat! I boil the giblets and neck and use that water as well as a can or two or chicken broth. If you do not want to use the giblets in the gravy or dressing, you can toss them. Sometimes I add some of the turkey drippings. I found if you put your turkey drippings in the refrigerator for awhile, you can skim a lot of grease off before you add it to your meat. I just layer the meat in a casserole or large baking dish and pour over the skimmed drippings. Breast down is a must. All those juices go to the breast and keep it moist. We are cooking two turkeys for about 40 people, I have to travel and will have to have turkey done at least two to three hours before dinner. Would this be something you could do and warm in a roasting pan? How much broth do you need to keep turkey moist, I am making all of the gravy so I might not have enough, can you use canned broth? I was just thinking about cooking my turkey a day ahead – thanks for the info on how to reheat. Now I can watch some of the parade instead of wrestling a turkey. Thanks so much for all the good tips. I decided to make just a turkey breast this year. And wanted to do it ahead of time to avoid the “MESS” in the kitchen on Thanksgiving Day. But when calculating cooking time for my 9lb breast , I calculate 3 hours. I read at beginning you said to cook a 20lb turkey 3 to 4 hours. Thanks again for great tips from everyone!! I cook my turkey in a roaster oven that can hold up to a 20 lb turkey. That way my oven is free for everything else. Also, the roaster oven is smaller and acts somewhat like one of those roasting bags so the turkey is always juicy and moist! I may try this….I do stuff my turkey…after cleaning it out and drying it completely as i am not putting my stuffing in a pool of blood, while the turkey is cooking the stuffing is also cooking and is not going to be soaked in raw, gross blood…..you just have to cook the turkey longer to make sure the stuffing is as done as the meat…..really, it doesn’t make sense to eat meat that was once raw but to think the stuffing is filled with something different?!?!? Am I missing something? Thanks for the shortcut post Laura! I think your #9 turkey breast will be too dry if you cook it for 3 hours. They are usually done in two. Check with your meat thermometer after 2 hrs. Thank you for this. It is too late for me to cook the turkey ahead this year, but I am definitely printing out this post to use it next year! Can you cook the turkey 2-3 days early and leave it whole for carving? I’m hesitant about that, but I’ve never done it so I can’t say for sure. Cook time??? 15-20 min/lb for 20lb turkey is 5-6.66 hours, not 3-4 hours as stated?? Or is my grade school math way off? But I even used a calculator like kids do nowdays! You are so right – I miscaculated that and need to edit the post! Sorry, I didn’t see someone already commented on the timing issue. Just use a meat thermometer to be sure! When cooking the turkey ahead of time, do I make gravy then and reheat, or make the day of with the turkey juices? I always wait and make my gravy right before serving. I find that it works better that way. I used to stuff the turkey, but got caught with slow cooking turkey and the family waiting, so now I cook the stuffing separately. However, I cook it in a oven cooking bag, so it resembles the moistness of the inside of the turkey method. Doesn’t dry out in the oven. I cooked my turkey the day before last year. I did put a foilpan filled with water in the oven on the lowest rack when I reheated the turkey. It was perfect. One guest actually wanted to know if I cooked the turkey in a special roaster. I will cook my turkey on Wednesday once again and really enjoy the holiday. Forgot to mention that I cook my stuffing in a crockpot and it comes out great. I cook my turkey in a roasting pan on the grill (Weber)on Wednesday. Of course, you can also do it in the oven. I carve it and then put it all in one of those white electric roasters, much like the post says, and reheat it the next day. I also make my gravy the day before. And, I make my mashed potatoes early in the day and put them in the crockpot to stay warm. Everything is ready and piping hot at the table all at the same time. Bonus? No big mess to clean up! I’ve had enough stressful holidays trying to do it all at once to where I’ve come up with a much easier solution so I can enjoy the holiday, too. Thank you very much for your tips. Very helpful Now I can realy enjoy myself and my company. and make sure to wash and take out insides first! I’m pretty excited – scratch that…Ecstatic!- about cooking the bird in advance! It’s my first time doing the entire meal for a family that has grown accostomed to my mother-in-law’s “best turkey dinner in the land” reputation. Well-deserved I might add, but she’s up in years & it’s time to pass the torch. Luckily she has shared her recipe secrets but this will be my lil secret that I’ll pass on to my more modern family & by the way – what the dozen or so people I’m feeding don’t know won’t hurt em…;) I plan to cook 2 birds -a larger one in advance which is also a great way to have some pre-bagged leftovers to send home w/ the fam & a smaller one (or maybe even a breast?) the day of so the house will smell delightful and we’ll still have something to carve:) Thanks again. Now I’ll actually have time to get out of my robe and slippers before the guest arrive. I have cooked our Thanksgiving turkey the day before for many years. I let it cool for 30 to 45 minutes and debone all the meat leaving it in whole pieces. The next day I carve the turkey, place it in the crock pot and drizzle some of the broth over the top and heat on low for a couple of hours. I can’t tell the difference between that and right out of the oven turkey. I have a very small kitchen and not having that mess the morning of a holiday is a big bonus. I do the same thing when I make a baked ham. Works every time. I also cook the dressing in the crockpot. I make it the day ahead of time and place it in a well greased crockpot and place it in the fridge till morning. It takes about three hours on medium / high. It makes a nice crust but if you don’t want that just stir every hour or so. Do you cook the dressing ahead, then reheat? Or do you just assemble it ahead, then reheat in crockpot? Chopped celery, chopped onions, chopped apple, raisins, Brownberry croutons, seasonings, and broth. Would I need to completely bake this if done ahead? I would like to cook my turkey the morning of the dinner. If it is finished cooking by about 1 pm. is it safe to sit in the roasting pan at room temperature until dinner at 5 or 6, then carved and served with the gravy? I think so, but you may want to do a little more research on that to be sure. food safety rules indicate that food should only sit at room temperature for 2 hours and only 1 hour if the room is at 80 degrees – which mine will not be. I was figuring that I could let it sit out longer than 2 hours because it will take a turkey at least one hour to reach room temperature. maybe I should remove the bread stuffing? Linda, definitely do not let the stuffing sit in the turkey for hours. Being a moist food, foodborne illness is possible. The 2 hours rule is for food that is sitting at any temperature between 40 and 140 degrees. So leaving the turkey out that long is just not a good idea. Either 1. start the turkey later so that it is done around 5 p.m. or 2. carve the turkey after removing the stuffing, pour some broth over the meat, refrigerate all, and reheat when it’s time to eat (that would take a lot of work, fridge space and reheat space! ), or 3. use Laura’s method of cooking ahead. Thanks for the insight on cooking the turkey ahead of time (proper storage, etc). My husband and I are living in Thailand and hosting a large group of other ex-pats for “Friends”giving. I want to be able to enjoy the evening with new friends and not be stuck slinging turkey bones all over the place in front of them. I’m cooking my turkey as I type and appreciate the tips! CAN I COOK A TURKEY THE DAY BEFORE, THEN PUT IT IN THE FRIDGEAND WARM IT UP WHOLE THE NEXT DAY IN THE SAME ROASTER. How much broth should I add for a 15 pound pre-cooked turkey already carved and do I add the broth to the turkey before refrigerating it or just before reheating it? You can add it before refrigerating or after. I’d probably add a cup or two of broth. There’s nothing exact about it – just depends on how moist you’d like it to be! Thank you so much!!!! I will have 20 guest for Thanksgiving and I’m going to cook the turkey ahead of time,now I’ll be able to drink wine and enjoy myself!! Well we always eat at noon so I’m doing my turkey 5 AM but this year due to some family members having to work we will be eating at 3. This is great as I’m always having to pull out and put in things in the oven. Now I ca do turkey at same time and still have time for other things in the oven but if I don’t want to de-bone turkey can I just put whole turkey back in to warm? I’ve never done it that way, so not sure how it would work. I’m afraid it would dry out as you’re trying to reheat it thoroughly.